In 2009 we were able to get approval from the parish administration to have the 3,949.2 sq.ft. grass space with 5 trees on it to relocate our preschool playground. 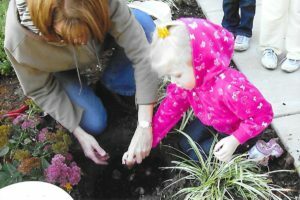 We launched our nature playground project in 2010 by first educating Sts Peter & Paul parish families about the need to ensure that children are given opportunities to be in touch with nature in our preschool curriculum. We outlined our goals to create an accredited Nature Explore Classroom through Dimensions and the Arbor Day Foundation. 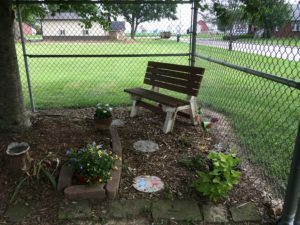 We accomplished this through an article in our parish newsletter which featured a photo of our Science Observation Garden that had already been completed with the donated help of a parish member who has a landscape business, my brother-in-law, and my sister. In several special news features to our preschool families, we laid out our plans, the specific nature features that we were hoping to have, and I requested their help of time, talents, and money donations. 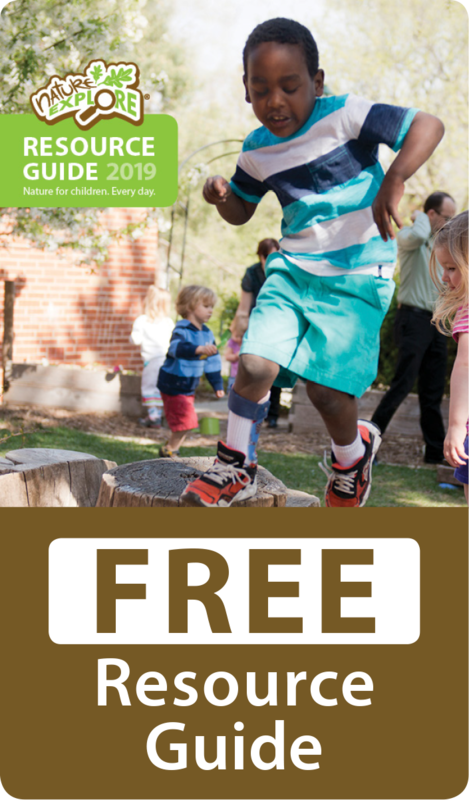 I also included a copy of information from the Nature Explore Resources that explained the research-based findings of connecting children with nature and what a Nature Explore Program should include. The response was amazing…more than we hoped for in that first year! 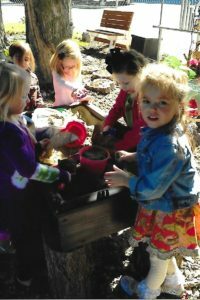 At our annual year-end celebration that year, we were presented with a large sum of money that had been secretly collected from all of the preschool families to be used to start creating the nature features. Two of our preschool families organized two other fundraisers for the playground the following school year. One of our preschool teachers created a story photo book using photos of our preschoolers in it, and we sold copies of the books as a fundraiser for the playground as well. Several families contacted me as an offer to make specific nature features with my direction. We would work on the special features each summer when preschool was not in session. 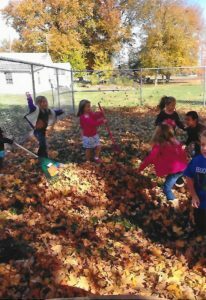 Every fall when school would start we would send preschool families a special flyer to update them on the continued progress and thanking the special groups or families that had helped us to complete the additional nature features on the playground. We had full support and encouragement from our principal, Mrs. Kalyn Herrmann, for all fundraisers and family projects. 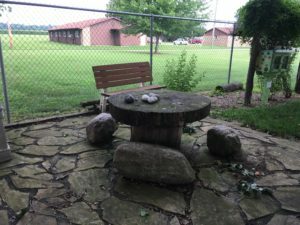 We posted photos of our new playground features on our parish/school website, and we also submitted photos and articles about our nature playground progress each year in our local newspaper, The Star-Times. 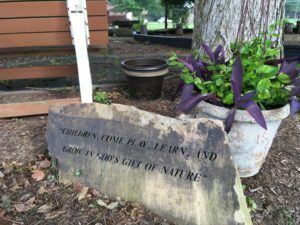 As children play in our completed nature playground, various photos are taken and posted on our Kinder Haus Facebook page, so parents can see the benefit of how their child learns through nature. 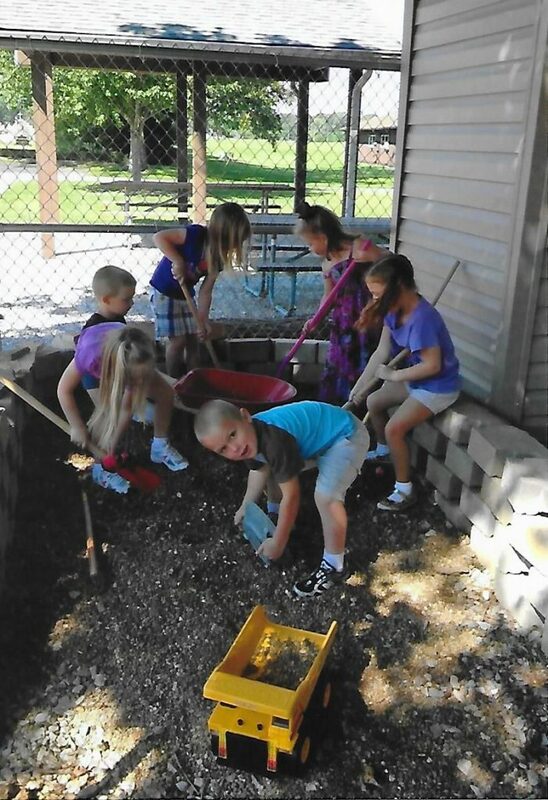 Several older children and teens, who were former preschool students at Kinder Haus, contacted me and asked if they could help in any way– from removing sod, laying up a small stone wall, and weeding chores during the summer. One former student donated a music/tone panel out of PVC pipes that she & her father made at school. A scout from a local Boy Scout Troop contacted us to see if there was something he and his troop could construct or do for us on our playground to earn his Eagle Scout Badge. 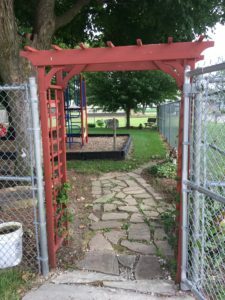 The whole troop and their fathers helped remove sod and lay stones for our Diggin’ In The Dirt area, and they created an arch using fencing to make our vine arbor area. We were so grateful for that Boy Scout’s help and for the opportunity to help him become an Eagle Scout! One of the ways that we continue to bring about awareness of connecting children with nature is to host a special time for families to see their children playing, exploring, and making discoveries in our nature playground. During the beginning of the school year as part of our “Get Acquainted Evening” event where we have orientation for children and their parents, we end the evening by taking all of the parents and children into our special nature playground and again during one of our year-end events as well. Approximately 40 families were directly involved in organizing and doing the actual labor or because of their business affiliation. However, including all who donated money and have had children in our playground and received the education about the importance of nature play through the past 7 years of this project, the total number of families would be around 66 families each of those 7 years (over 400 families).